Set a rack in a rimmed baking sheet. Season the steak with 1 tablespoon of salt and transfer to the rack. Refrigerate, uncovered, overnight. Let the steak come to room temperature 30 minutes before cooking. Preheat the oven to 400°. Heat a large cast-iron skillet until very hot, about 5 minutes. Pat the steak dry with paper towels and season with salt and pepper. Cook the steak over moderate heat until browned and crusty, about 3 minutes. Add the butter, turn the meat and transfer the skillet to the oven. Roast until an instant-read thermometer inserted in the thickest part registers 120° for medium-rare, 12 to 15 minutes. Transfer the steak to a work surface and let rest for 10 minutes before serving. 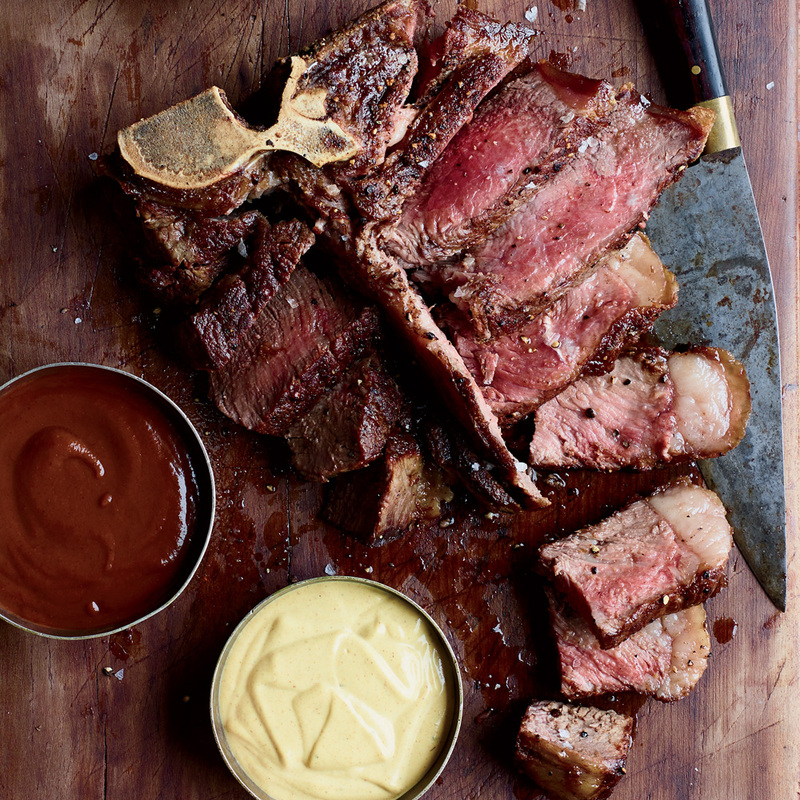 Green Peppercorn Jus, Curry-Mustard Mayonnaise and House Steak Sauce. Review Body: I always thought that you wanted to keep the juices inside of the meat. Review Body: How does leaving it uncovered improve the taste? Review Body: Why heat the cast iron skillet in the oven rather than on the stove top? For a better, more accurate, temperature control? Review Body: Do you cook the steak in the hot skillet on both sides before you put it in the oven? Total of 3 minutes?